This page shows current UK Lotto reuslts shortly after the official draw held each week on Wednesday and Saturday. Current results are always available within an hour from the official draw. Above, you can find the four latest draws including the Millionaire raffle. Each line shows for each number the number of jackpot rollovers. If you are not sure what they mean read our detailed article focused on rollover. To view more you must go to the archives page showing all historical results. Above, you can see winning Lotto numbers drawn on Wednesday. Here, you can see winning Lotto numbers drawn on Saturday. Draws take place twice a week, on Wednesdays and Saturdays at 8:30 p.m. of local UK time. 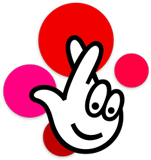 People can watch each draw online at YouTube channel or at the National Lottery website. Alternatively, you can press the red button on your remote control to view the results just after the BBC One news at 10:40 p.m.
All draws taking place at Pinewood Studios (Buckinghamshire) are recorded. The recordings are then available at the above social media. Safety: Can anyone fake the results? All steps of the drawing process are supervised by a notary and a member of the UK Gambling Commission. One drawing machine with one set of balls is used for each draw. The set is selected randomly to minimise any potential fraud. In addition, the machine and tools used for drawing are periodically checked and tested. You can find more details about the process and safety of draws in our special article. There are 13 sets in total, each having a specific name. The first six names come from the legend about King Arthur and Knights of the Round Table. The remaining seven are named after precious stones. The drawing is moderated by an MC. The MC first invites all spectators, announces the draw and the size of the jackpot. Then, he switches on the lottery drum containing 59 balls from 1 to 59. The machine generates six numbers one after another and finally the Bonus ball. After all numbers are draw, the drum stops to rotate and the MC recapitulates the winning numbers. At the end of each draw, a randomly generated number of the Millionaire raffle is drawn. Online, using a mobile application made by the National Lottery, is the easiest way to check the numbers. All what you have to do is to scan your lotto ticket to see immediately if you have won. The second best way is to use the Lotto result checker at our website, lottomag.com. Each player can check the results independently. Matching of two main numbers is the minimum to win a prize. A complete list of all tiers and prizes can be found here. If you win don’t forget that you have 180 days from the draw to collect your prize.